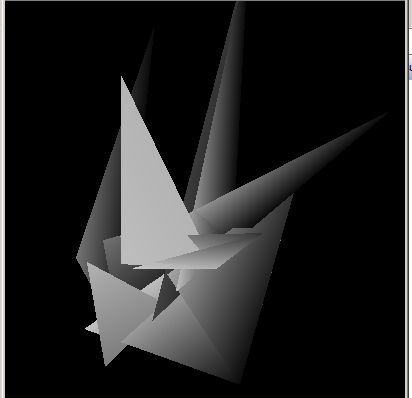 The displayed geometry should be a simple cube but all I get is randomly oriented triangles (see figure). I was reading about the glVertexPointer() problems in PyOpenGL here and found the solution with ctypes.c_void_p() but I am not really sure how to implement it. Can someone point out what am I doing wrong or missing here? Or how can I fix this? Based on the documentation the stride parameter is offset between 2 consecutive arrays of the same type (vertices, normals, colors...) (in bytes) in VBO array. Or not? But I still have problems with colors as the model is not colorful? :) Any ideas are much appreciated. Not the answer you're looking for? Browse other questions tagged python opengl vbo pyopengl or ask your own question. How to use the stride parameter in VBO? How to extract data for glVertexPointer() and glColorPointer() from a single array in PyOpenGL?